A white squirrel pauses on a tree branch near the Westboro Tennis & Swim Club. This white squirrel is a natural variation of the eastern gray squirrel. It is not an albino because its eyes are colored normally, rather than appearing red. Westborough has gray squirrels, red squirrels, and even flying squirrels, but do we also have white squirrels? It looks like there's at least one in town. This week's photo shows a white squirrel spotted earlier this month in the vicinity of Chauncy and Oak streets near the Westboro Tennis & Swim Club. The unusual-looking squirrel was scurrying among some trees in the area. Is this white squirrel an albino? That's a question that often occurs to people. The answer is no, this particular white squirrel is not an albino. You can tell because its eyes are colored normally, instead of red. Albinos have no pigment in their skin and fur, which appear white. They also lack pigment in their eyes, which look pink, due to blood showing through. Instead, this white squirrel is a natural variation of our common eastern gray squirrel (Sciurus carolinensis). Its white color is the result of a certain combination of genes that occurs by chance from time to time. Chance combinations of genes can also produce other natural variations, such as black squirrels, which are reported in Massachusetts more frequently than white squirrels. White and black squirrels in Massachusetts are eastern gray squirrels. They can all interbreed so they are regarded as the same species. How rare are white squirrels? They're more common than we might think. True albino squirrels – the ones with pink eyes – are more unusual than white squirrels with normally colored eyes. At least five towns in the eastern U.S. and Canada have whole populations of white squirrels. These towns celebrate their white squirrels as mascots and promote them as tourist attractions. One out of four squirrels in the scenic town of Brevard, North Carolina., in the Blue Ridge Mountains, is white. On the campus of Brevard College, an even larger proportion –35 percent – is white. Like Westborough's white squirrel, Brevard's 250 or so white squirrels are not albinos. They have normally colored eyes, and some of them have a gray patch on the top of their head. They reportedly descended from a pair brought into Brevard in 1951 by a man who got them from someone in Florida, who apparently found them after a circus truck overturned in his neighborhood. Brevard celebrates its white squirrel population with an annual White Squirrel Festival, typically around Memorial Day weekend. To protect its white squirrels, the town has designated itself a sanctuary for all squirrels. Exeter, Ontario, is a small Canadian town with dark-eyed white squirrels. It, too, runs its very own White Squirrel Festival. Some enterprising folks there sell white squirrel souvenirs. In Tennessee, the town of Kenton holds a white squirrel celebration in conjunction with the Fourth of July. It boasts a population of more than 200 white squirrels dating from 1869. Some towns do have white squirrels that are true albinos. Local albino squirrels, complete with red eyes, have provided the town of Olney, Illinois, with a mascot for more than 100 years. A biology professor at nearby Olney Central College has studied them for the more than 20 years. Olney bills itself the "Home of the White Squirrel". The town flag, the town newspaper , and the local police all use the white squirrel as an emblem. White squirrels have the right-of-way on town streets, and "White Squirrel Crossing" signs caution motorists in certain locations. There's a $200 fine for running over a white squirrel. 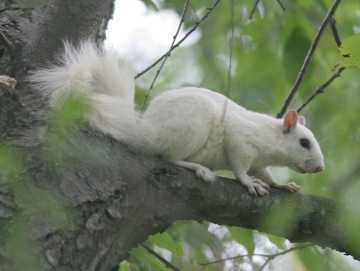 Marionville, Missouri, claims to have the oldest and largest population of white squirrels, dating from 1854. Their white squirrels are said to number between 300 and 600. Marionville calls itself the real "Home of the White Squirrel". Some people there suggest that Marionville may be the source of Olney's albino squirrel population. Numerous sightings of white squirrels have been reported elsewhere in the country. The places include towns in Texas, South Carolina, Mississippi, Florida, Kentucky, Ohio, Minnesota, Wisconsin, New York, and New Jersey. The sightings are sometimes documented by photographs. Other kinds of squirrels besides eastern gray squirrels can come in white versions. White squirrels seen in State College, Pennsylvania, the home of Penn State University, are reported to be variations of the local red squirrel. Not everyone welcomes white squirrels. Three populations of white squirrels apparently exist in the vicinity of Edinburgh, Scotland. The problem there is the very fact that these white squirrels are versions of our own gray squirrels, which aren't native to Scotland. Gray squirrels were introduced into Scotland from America and are gradually pushing out the local native red squirrels. Do white squirrels have any advantage when it comes to surviving? Probably not. Their white coats make them easier for predators to spot. Those that are true albinos also have trouble seeing in bright light, and that makes life more difficult for them because squirrels are normally active during the daytime. In places where they have flourished, white squirrels often get help from friendly local humans. Townspeople and tourists make a point of feeding them. Some towns pass laws designed to keep them from becoming roadkill. They may also protect them from hunting and trapping and being taken out of town.